This range is operated and maintained on behalf of the MoD by Landmarc Solutions. Military training takes precedence over civilian shoots and so dates may change at short notice. This is an outdoor military range and has no clubhouse. There is a loo alongside the butts, but porcelain and running water is all you get! The range has its own exit from the A11 roundabout just past Forest Retail Park, south of Thetford. MAP. Please arrive at 08.00 to help set up and be ready for a range briefing in the carpark at 08.30. 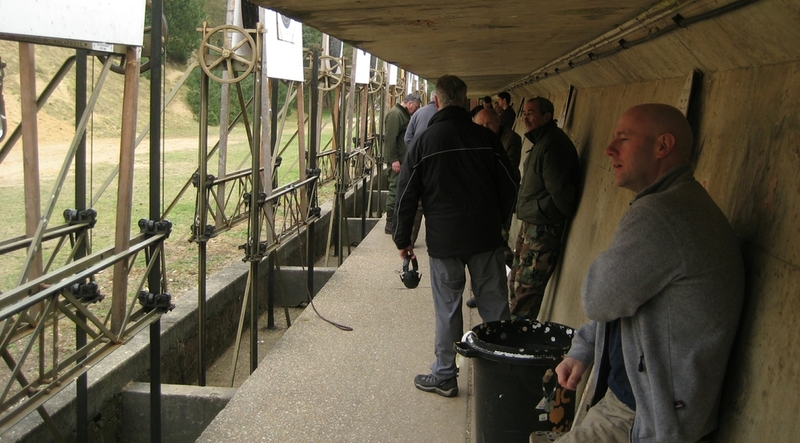 Attendees are then divided into two details, to shoot and mark targets. Shoots are held throughout the year but may be changed or cancelled at very short notice. Please check the club hotline and this website before setting out! See calendar. Fullbore calibres at various distances out to a maximux of 600 yards, prone or in pits. Thetford Gallery now has an ETR range which we sometimes book. There is a civilian muzzle energy limit of 4,500 joules on Thetford Gallery. Handloads are permitted but is your responsibility to know what level of energy your ammunition produces. Zeroing at 100 yards will be offered at the 8.30 assembly, for those who need it. Please ensure your rifle is properly zeroed before shooting commences! OVER 16s ONLY ON THETFORD GALLERY. SORRY, NO GUESTS. GROVE OR OTHER LICENSED CLUB MEMBERS ONLY.